In this morning’s Marketing Daily newsletter by Media Post, Sarah Mahoney makes a case for the fact that the recent change in the economy, more specifically the rise in gas and food prices, has brought out the thrifty, value-conscious side of many women, who have begun relishing the title of Chief Thrift Officer. The article states that women are more conscientious than in the past about shopping for value, eating leftovers and doing more shopping online now that high gas prices have made it a more attractive prospect, negating the shipping cost differential when weighed against gas cost and inconvenience of brick and mortar shopping excursions. The article also predicts that this trend of value shopping will continue after the economy bounces back because women are feeling good about themselves for creating smart, efficient shopping strategies that benefit their families. So now I’m weighing the marketing potential of this trend and mindset for my friends in the wine world. How can wineries and wine retailers make their offerings more attractive to these Chief Thrift Officers among their customer base? Is it via free or one-cent shipping offers? Possibly adding to the line of magnums and larger sizes available? 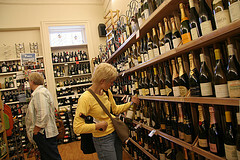 Expanding the number of wines in boxes and venturing into higher quality wine offerings in this category? Creating shoppers clubs with exclusive discounts and offers for members? This mindset is evident everywhere these days. Morning shows, news reports, magazines and newspapers are weaving shopping tips into their daily agendas and it is glaringly obvious that there has been a shift toward weighing value and price in our purchases. Although I don’t believe that we’ll stop buying wines above $15-20, we may see an uptick in demand for those in the everyday category and women hungry for “a good deal.” Is it time to consider launching that second label? Or how about that fun, tasty blend that you’ve been tinkering with?